a short documentation from the performance. Speck is the main foyer attraction for the 2015 Innovation Week Istanbul, a kinetic audiovisual experience speculating the volatility of ideas at the intersection of creativity and technology. Speck greeted over 50.000 people to the main event hall throughout the three days it was on exhibit, and has garnered a lot of attention especially from children and tech enthusiasts. 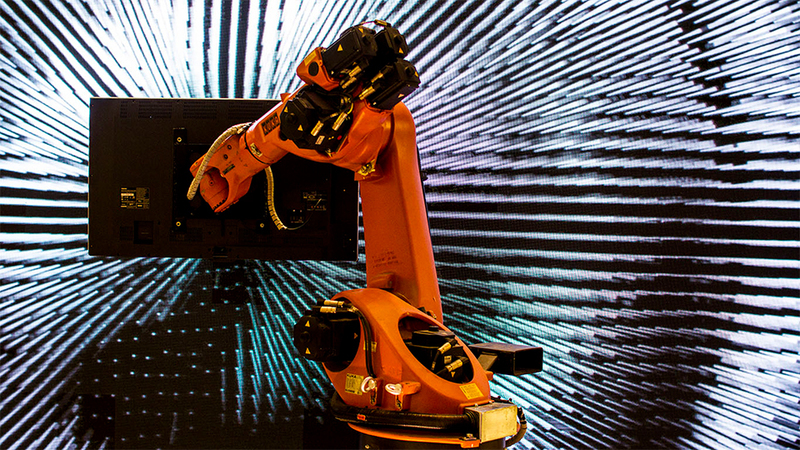 The video on the screen carried by a KUKA KR60 robotic arm interacts with the 3m*5m LED Wall placed behind the robotic arm. The full choreography is just over three minutes long and loops throughout the day. Visuals are created by NOHlab and the sound engineering is by Audiofil. Robotic choreography is designed by FABB.